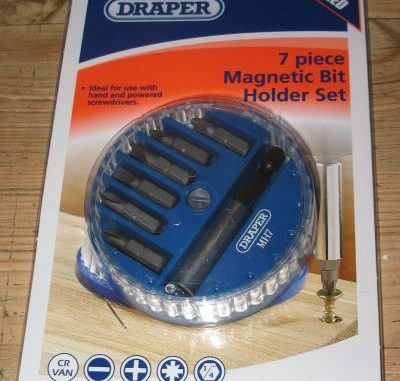 I was given this set of driver bits, they come in a rather nice circular dispenser. These are rather nice in the circular dispenser with a magnetic bit holder. Sometimes a few variations on cross slot driver bits and slightly different sizes of pozi driver bits are needed – I’m sure the sizes are meant to all be consistent, but the slight differences between manufacturers can mean that some work better than others. These have definitely been made for the DIY enthusiast rather than the labourer who has a box of driver bits all of the same size as they just get worn out. I will report back after I have used them for a longer period. A good price, but not sure how long they will last. 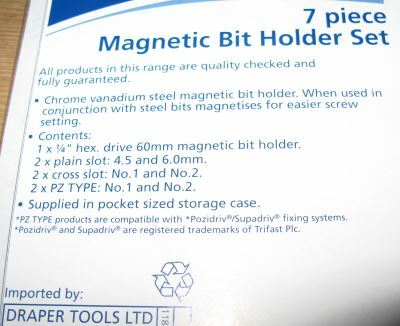 The magnetic bit holder is rather simplistic and not of the highest quality – will let you know how this stands the test of time.